On my trip to Singapore, I promised myself that I would eat as much Singapore style Hokkien Mee as I possibly could. I blame it all on my ex (who was Singaporean)! He got me hooked on this yummy carb-loaded dish.... which is an eye for an eye I suppose, considering I introduced him to a lot of yummy carb-loaded Malaysian delicacies which ruined his otherwise healthy diet. As it was a food court, I was hoping for the best but expecting the worst. The noodles - supple yet moist without any starchy aftertaste. The sauce - bursting with deliciously savoury flavour of the eggs mixed with garlic and chicken stock. The sambal/ chili sauce was also pretty good - fragrant without being too spicy. My only complaint is that the prawns were horrible - they didn't taste very fresh and all the flavour and texture had been boiled right out of their skinny little bodies... but otherwise, the Hokkien Mee was nice overall. 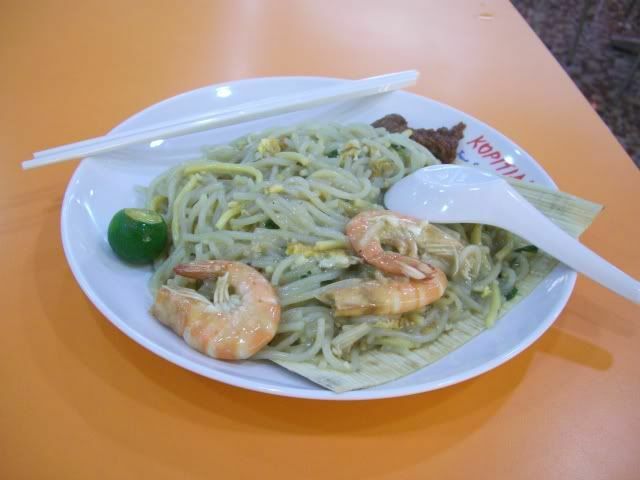 As you can see, the Singaporean version of Hokkien Mee is very different from ours here in Malaysia. Ours is dark, rich, fragrant and tastes wonderfully sinful whilst theirs is light, "ching" (clear) and tastes loads healthier somehow - probably mainly because it doesn't come with pieces of "chee yauw char" (deep fried pig fat). I know a shopping center food court would not be considered a good place to look for authentic and delicious local food but it's convenient lah. My trip to Singapore was only for 3 days and I didn't have time to go look for the famous hawker centres/ coffee shops that are not in the main city/ shopping areas. If you have time though, the hawker centre in the main Serangoon Gardens area (which is about 20 minutes away from the Orchard Road area) has a great Hokkien Mee stall. 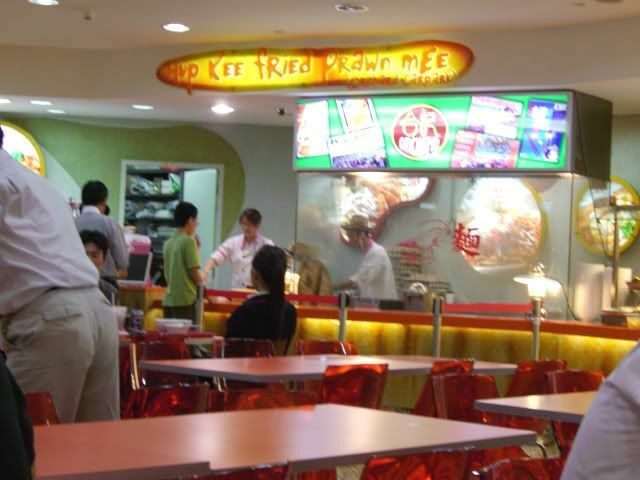 So, it's: Delicious and affordable Singaporean Hokkien Mee in a clean and modern food court BUT Singapore Dollars to Malaysian Ringgit forex tends to hurt the wallets of poor Malaysians like myself! 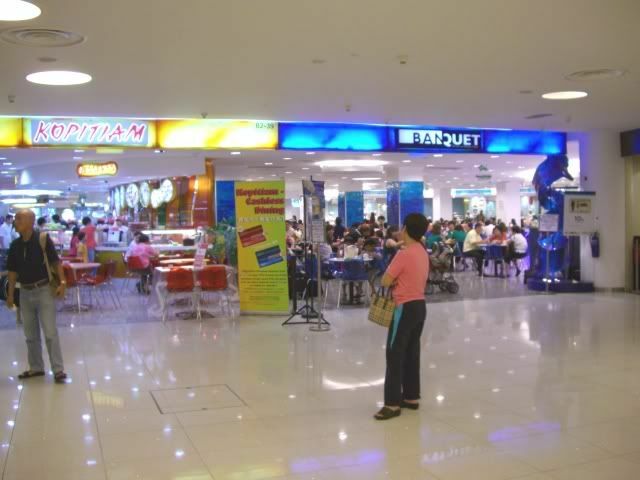 Address: Level B2, Kopitiam food Court, Vivo City Shopping Centre, Telok Blangah, Singapore. ... but I double checked the address to some sort of restaurant listing online. Anyway, thanks for pointing it out - I'll correct it soon. The best S'pore Hokkien Noodle I've ever had is at the Food Republic foodcourt in Atria Shopping Centre. * I think Blangah means cooking pot. The proper Malay word for it would be "Belanga". I will try it out next time I head down to Singapore. Sounds likely.... How come the spelling is so off though?? Well, both styles of Hokkien Mee are so different... and both have their good and bad points. I kinda prefer the Singaporean version actually - but I think it's only because I don't get to eat it very often so its "special". Penang Hokkien Mee, Penang Hokkien Char Mee, mmmm..... many yummy Penang food. Yeah, I kinda miss visting Sg too - but you're right: the exchange rate is a real killer.